Deacon Dr. Fresh Wine Newsletter: Best Wine Before a Lengthy Prison Term! Snow Stalls the Deacon's Winery Tour! Today your humble Deacon's gonna be answering some of the questions y'all axed in the last few days. Let's start with this one from close to home. You bet your jockstrap Daniel! The Deacon teaches most Wednesday nights with the Lurch Legionaires: Dave "Peppy" Duhaime, Chris "Polish Power" Umiastowski and the Deacon's protege and bodyguard, Adam "The Sadist" Sutherland. We lurk near Kingston Road and Victoria Park. Send me an email and I'll get Adam to connect with you. Then you can learn a system that really works; not one of those "Let's leap 30 feet in the air and kick him in the head, even though we're in an elevator, martial arts systems." This be the lurch deal, Jack! Come check us out. Gloria: If you'd been payin' attention instead of wasting your brain-cells watching Oprah and Canadian Idol, you'd know that the Deacon's been watchin' the N.Z. Pinot for some time. Go grab a bottle or two of the 2004 Oyster Bay Marlborough Pinot Noir. I tried it the other night at a family dinner and it was well worth the coin, despite it's apparent youth. Rozeen: Poor Delmonico! My heart goes out to you, Bro. Sometimes you do everything right and you still get hosed down. There's a real life-lesson here: Crime does not pay...unless you're more heavily armed than they are. You should always carry the heaviest weapons possible. A TASER aint no match for a Heckler and Koch MP5. Anyone who thinks it is, should bring a TASER and try to break into Fresh Mansion and see what frickin' happens... Anyway, I digress...There's only one wine for Delmonico's Goin' Away Forever Party. 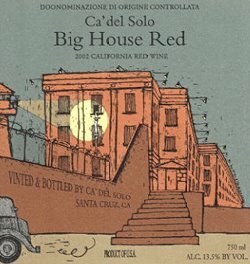 Tell the ladies to take him a bottle of Ca' Del Solo Big House Red. It's beefy and lurch and will go through him like a hot car! Just wonderin’ how to get the Deacon a copy of my brand new CD, ‘Beulah Land’ which is poised and all a-frickin’-quiver, hopin’ for his Lurch testimonial. Now, if the Deacon feels Ah’s a bit short of sub-stantiation, his peeps kin axe around about me. Dan Speck, His Eminence Charles Baker (the only wine weasel in Ontario who can drive to the hoop with either hand), Karen LaVigne, Anton Potvin, Beppi Crosariol, Dan Vollway, Peter Bodnar Rod, John ‘Smooth’ Szabo… and just bout any dog who saw me at the Hillebrand Blues Fest in August will testify to my repletion in every aspect, ‘cept puh-haps melanin. But dat’s not my fault. Axe dem. Ah think the Deacon will find ‘Beulah Land’ much closer to his stated love of ‘blues guitar’ on the man’s profile page than the avowed - and, methinks (which is Ye Olde Cracker fer ‘I s’pose’), somewhat tongue-in-wine-stained-cheek - forelock tug to Yngwie. Yet, is dat not the beau-tay of the human condition: unapologetic conflict within the frickin’ cranial fermenter? Ah thought so. Listen, dog… Ah’m enjoyin’ the Deacon’s partick-ular view of the bidness here in the Still-Great-But-Not-So-White-North. Y’all keep up wit’ da Big Throwdown. P.S./ Puh-haps some day we kin exchange displays of personal power. For a demonstration of British Jiu Jitsu, ah would be honoured to offer up some of the Secrets of Samoan Cheesemaking, with an emphasis on Mauna Loa Muenster, secret weapon to the stars.